A reenactment of a sausage party. Note that these sausages are "drinking" red wine through their skin, as they lack a mouth. All sausages drink that way during sausage parties. Sausages, much like other sentient self-aware foods, enjoy parties. The sausage's unique culture — a blend of various other meat's cultures, all rapped up in a metaphorical animal intestine casing — lends itself well to the art of the party. Certain elements of sausage parties are unique to their region, while other elements are widely observed internationally. 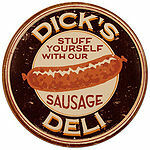 The first recorded sausage party was chronicled by Ignatius of Antioch, a well known figure among Catholic humans. As the story goes, Ignatius had purchased several sausages one afternoon, and then left them in his kitchen. The sausages — eager, as always, to party — had thrown caution to the wind and started to drink and make merry in Ignatius's kitchen without first taking the necessary safety precautions. Needless to say, Ignatius discovered the sausage party, and upon documenting the story, he was sentenced to death by arena. However, he will always be remembered, by some, for his bravery in documenting the singing and dancing sausages in his kitchen that fateful night. A sausage on his way to a fancy sausage party. While it is clear that sausage parties took and take place before and after Ignatius's documentation, there have never been any other clearly labeled documentations or documentaries on the subject. There are, however, from time to time news items detailing sausages that have been mysteriously "moved" across kitchens during the night, and which inexplicably taste of alcohol. Several members of the band Primus did a side project and called their side band "Sausage". Some experts on the subject maintain that sausage parties are a myth. However, most of those same experts do not believe in Santa Clause, the Loch Ness Monster, or Dana Carvey. 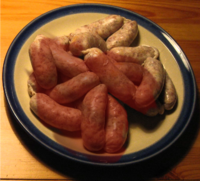 For those without comedic tastes, the so-called experts at Wikipedia have an article about Sausage. Drinking. Primarily, all sausage parties include alcohol. This is due to both the facts that sausages tend to be deeply depressed fatalists who enjoy drowning their sorrow in wine or gin or scotch whilst discussing the various ways in which they can and will be eaten, and the fact that sober sausages aren't very good singers or conversationalists. Have you ever had an engrossing conversation with a sober sausage? Exactly. Singing is also a key element of most sausage parties. Usually, sausages sing selections from Iron Maiden, Slayer, and Simon & Garfunkel, however they have been known on occasions to create compositions of their own, which usually deal fatalism, animal intestines, or the Highlands. However, the most important typical going-on at a sausage party is secrecy. All sausages who are on their way to a sausage party are required to lie to anyone who asks where they are going. The typical lie is that they are "off to a barbecue".